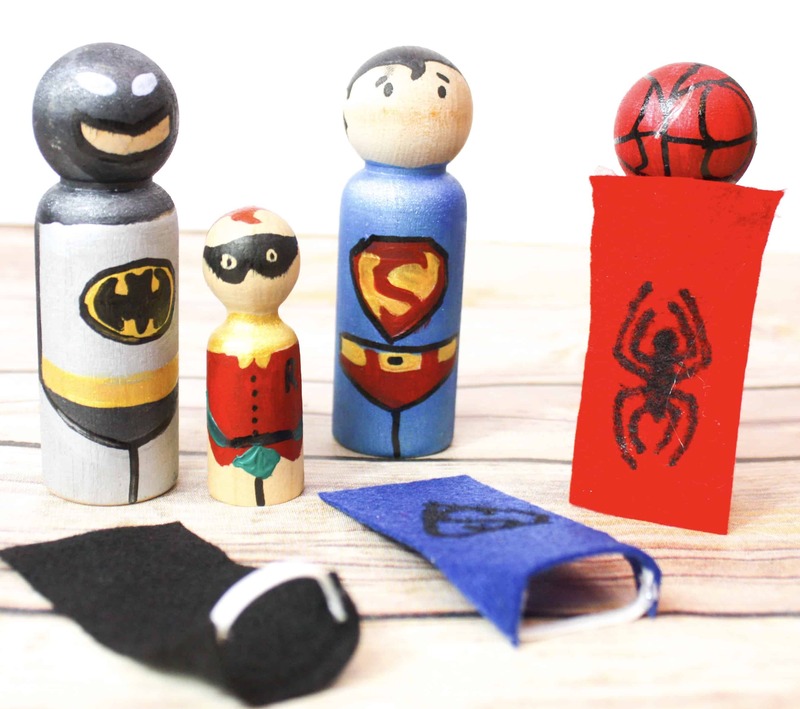 These superhero peg dolls are the perfect DIY toy or homemade gift for kids. 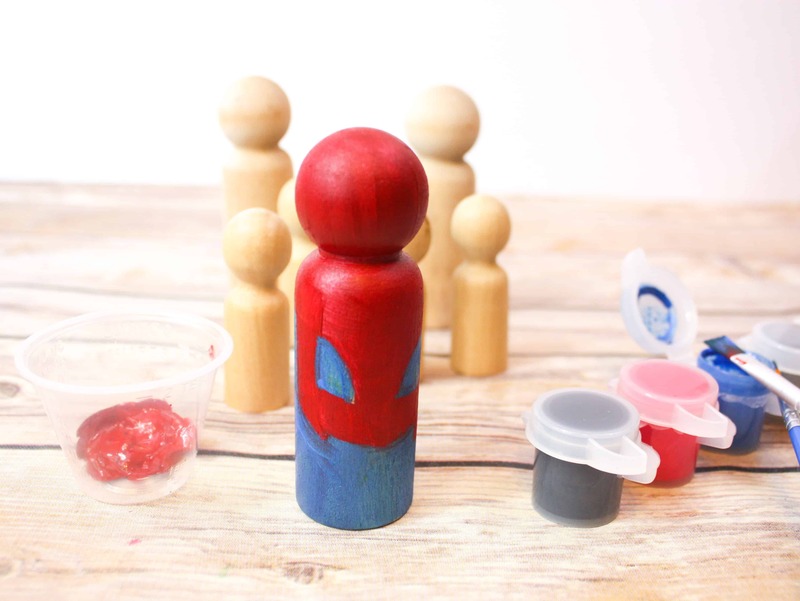 A simple tutorial for Spiderman, Superman, Batman and Robin. 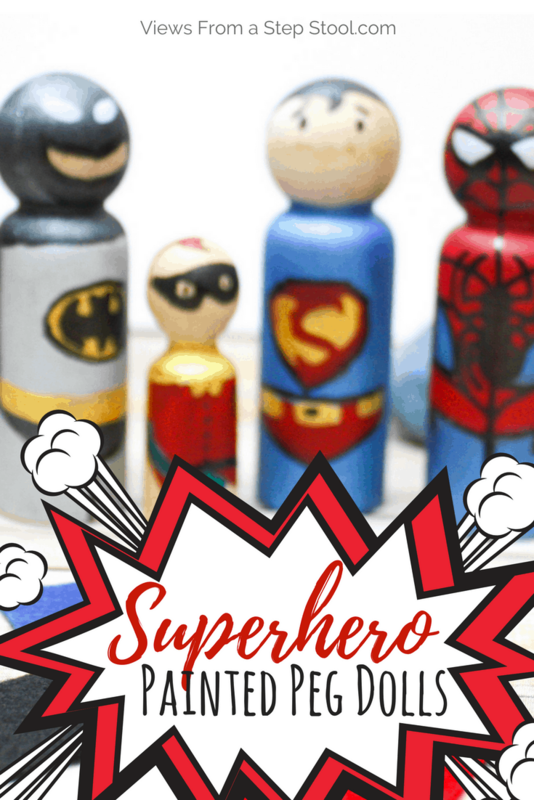 My littlest one LOVES superheroes. 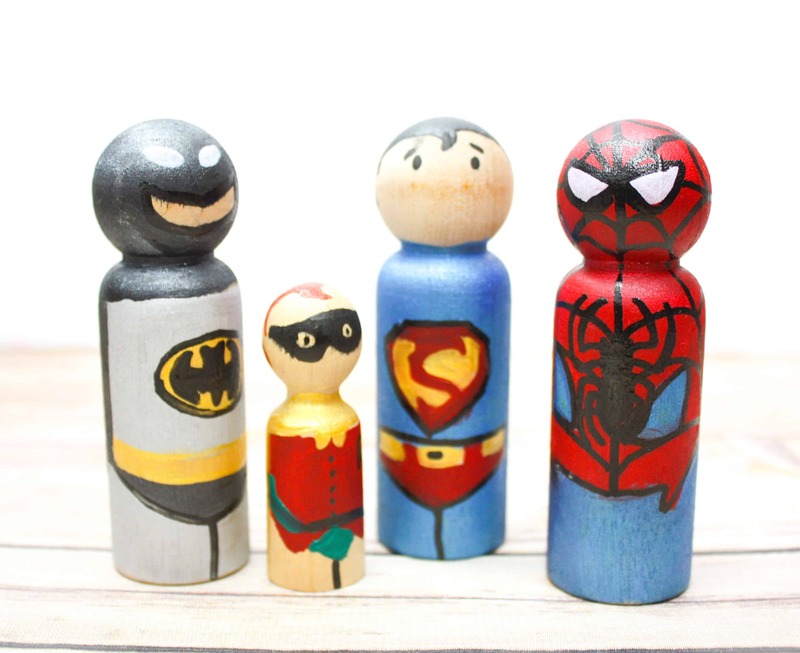 Almost as much as I LOVE wooden toys. 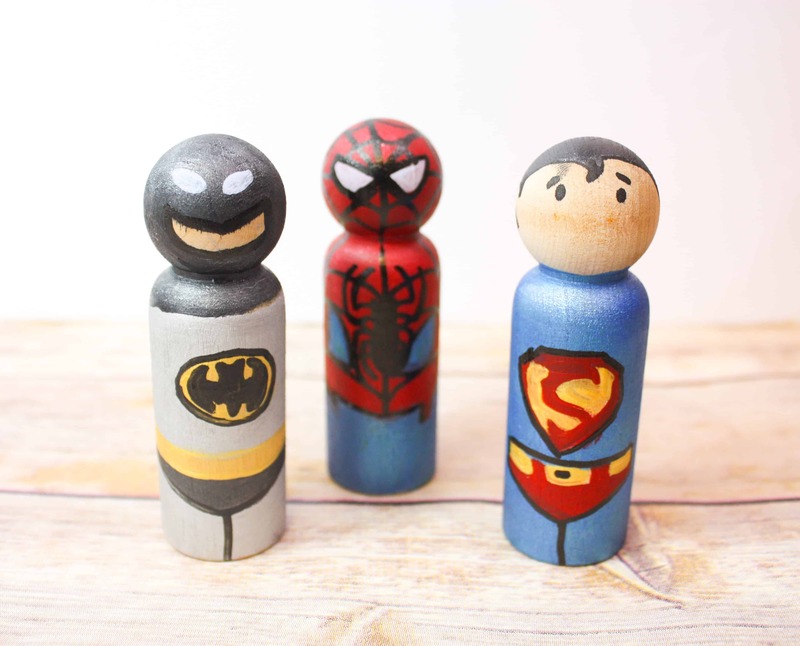 When shopping around for some wooden superheroes, I couldn’t quite find exactly what I was looking for, and since we love painting peg dolls, I figured we would give some superheroes a go! 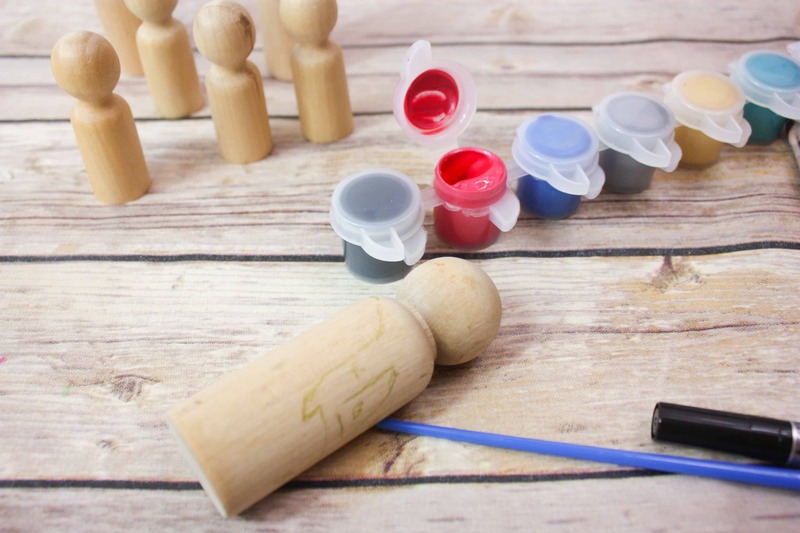 He just adores these, and I love the opportunities for open-ended play that he gets with them. For Superman: Leave the head natural, and paint the body blue.Add the Superman shield in red and gold, along with the underwear. For Batman: Paint the head and neck black, leaving the smile natural, and paint the body silver. Add white eyes, a gold emblem, and gold and black underwear. 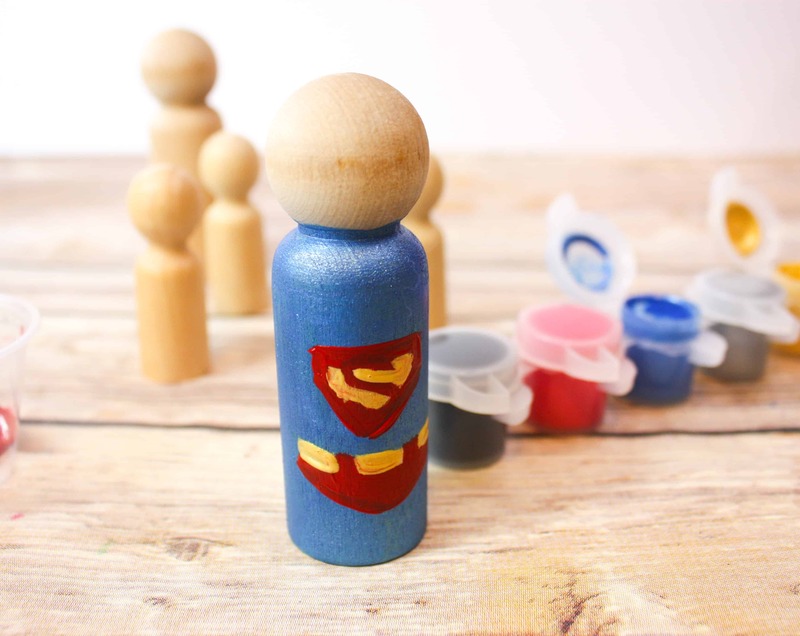 Once dry, use a paint pen to add all of the details and embellishments, this step will really make these superheroes come to life! Refer to the pictures below to see the details I added. 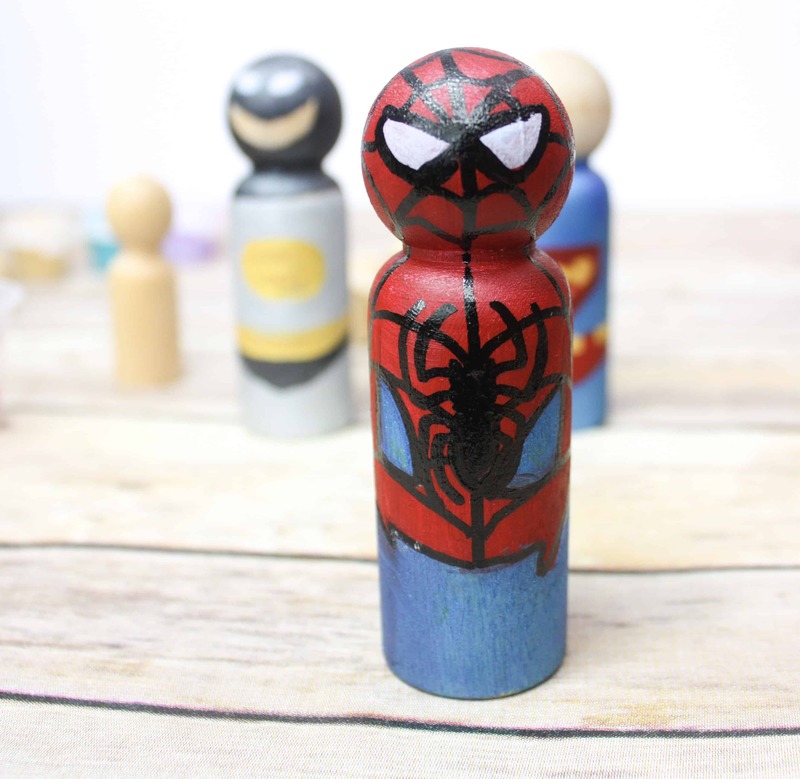 With the exception of Spiderman, it’s a lot of outlining what you’ve already painted. 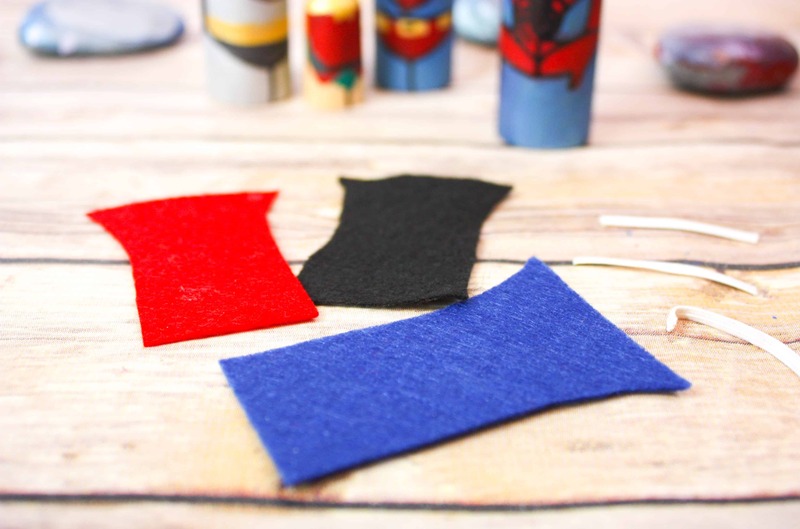 Cut some rectangles out of felt with a little flare on the bottom along with some small pieces of thin elastic. 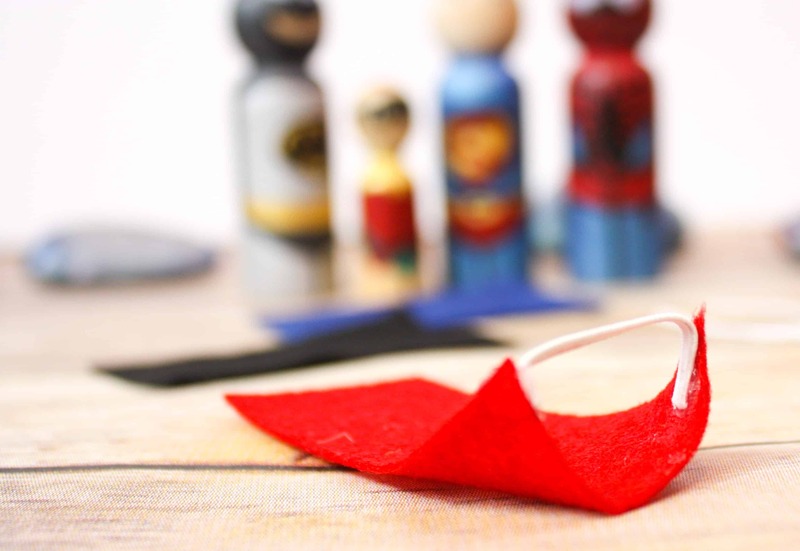 Hot glue the elastic to the ends of the felt and let dry. 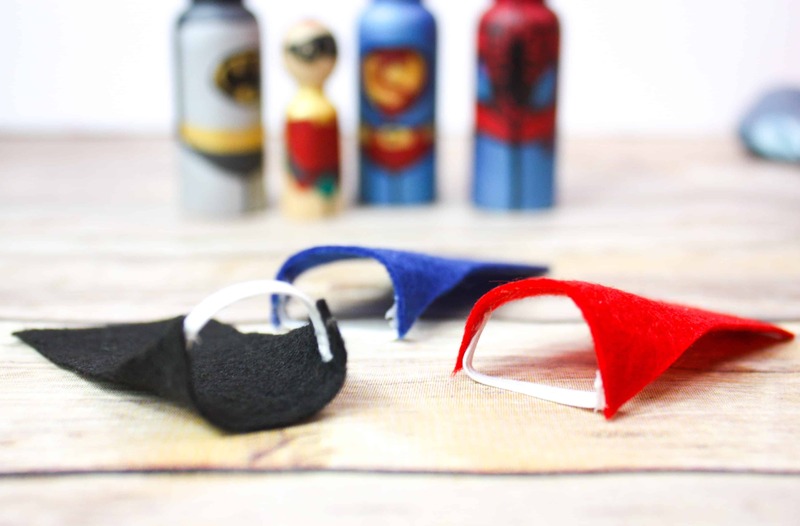 Simply slip the elastic around the head of a superhero and you have a cape! 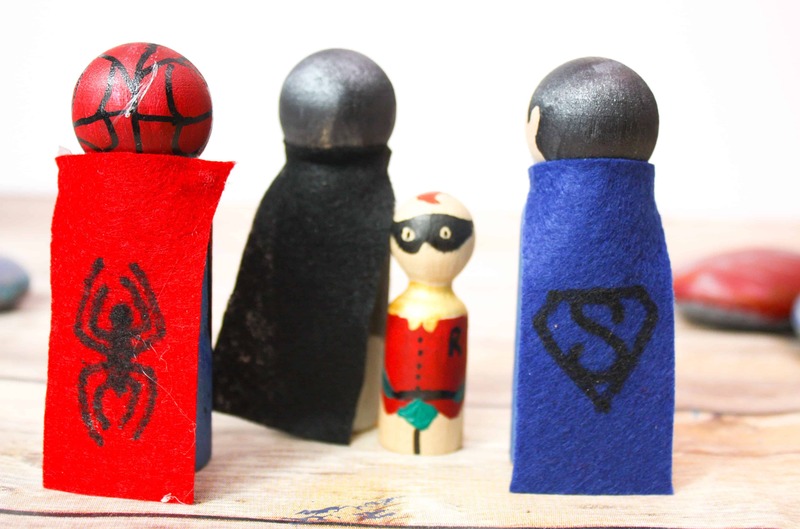 Add some superhero logos to the back as a little extra. 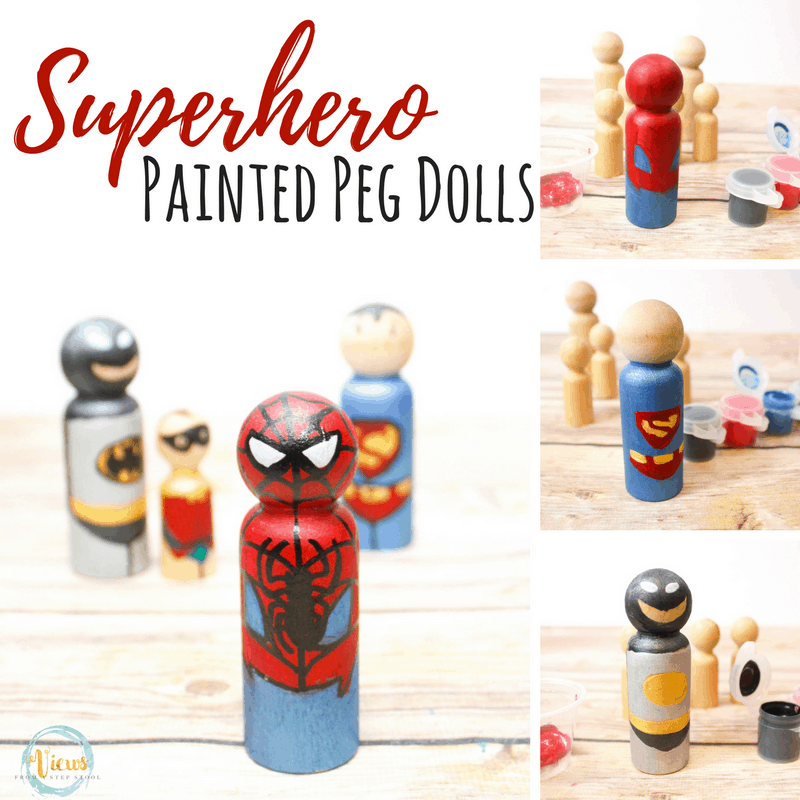 Have so much fun making these superhero peg dolls! 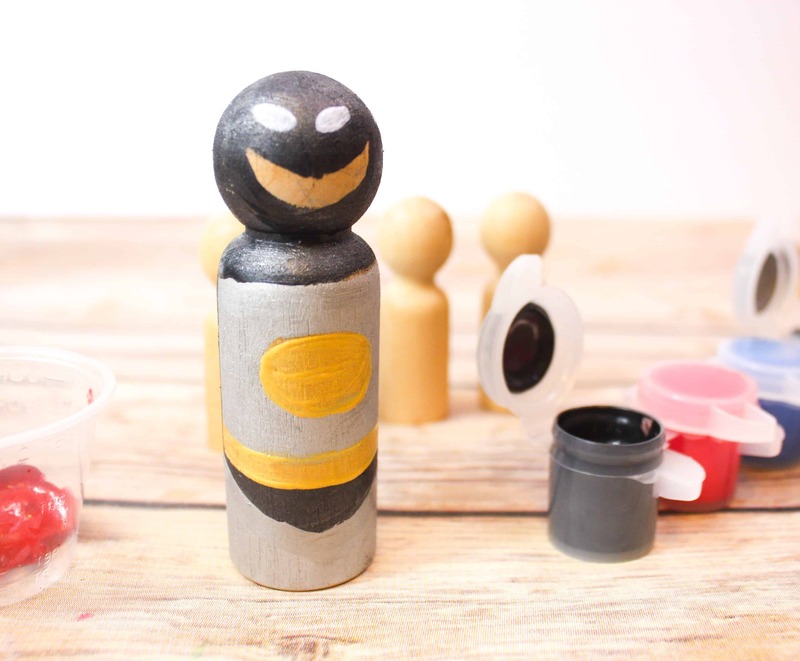 What a great DIY toy or homemade gift for kids!